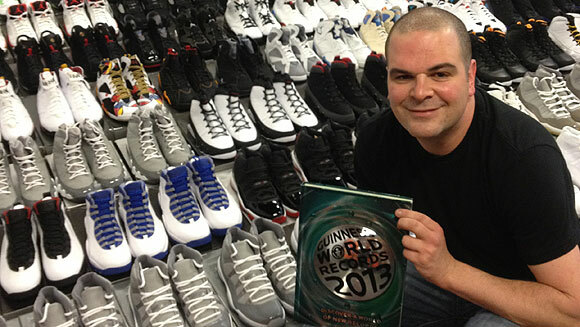 Jordan Geller has a passion for shoes, and has taken his passion to another level by being the first to open the world’s largest shoe museum, owning 2,500 separate pairs of Nike shoes. He has been featured in the Guinness World Records for this feat. Before this, he was just a regular ol' sneaker-head. “My dad was a runner so I grew up watching him wear Nike shoes. When I would go with him to buy shoes, I would look around in awe at the brand.” Geller said. As a big basketball fan, Geller said he always felt a connection to Michael Jordan because of their name similarities. While Geller was attending the University of Arizona for his bachelor’s and then San Diego for law and business school is when his interest in collecting and reselling Nike shoes began. “I was a struggling student and didn’t have much money. One day, I was at a swap meet, killing time, and saw someone buying cheap Nike shoes, so I bought 15 pairs and sold them on EBay for a profit.” Geller said. Geller’s 15 pair business soon turned into fifteen thousand pairs of shoes, at one point needing an extra one-bedroom apartment above his to store his shoes. Geller graduated, passed the bar and has never found the need to practice law. Geller, like many other sneaker-heads has gone above and beyond to get the shoes in his collection. Originally, Geller would rummage through the shoes at Nike outlets to sell for profit, until Nike banned him from reselling shoes. “I think they didn’t like that fact that I was making a lot of profit from their products,” Geller said. “I really built my EBay business out of the Nike outlets. Before, you could find boxes of Air Jordan’s shoes sitting on the racks for cheap. There wasn’t much hype on Jordan’s like there are now,” said Geller. However, Geller’s passion did not end there. He took the ban as motivation to open his ShoeZeum and prove a point to Nike. Geller’s ShoeZeum first opened for a short time in San Diego, then for a few months in Las Vegas. His goal was to build a place that have never existed before and he succeeded. The ShoeZeum was every sneaker-head’s dream that not only filled with 2,500 pairs of shoes, but also paraphernalia related to the shoe’s stories. “All of the toys and props that made the shoes would remind you of your childhood. Adults would come through the ShoeZeum and look like children, like in the movie ‘Big,’ it was an amazing thing to witness,” said Geller. Sneaker-heads and athletes from all over have toured the ShoeZeum, including Nike executives, who have even used his tours as inspiration for their Nike workers. For a while, Nike was even paying for his ShoeZeum rent. Nike banning Geller might have been the best thing to happen for sneaker-heads around the world. Since the success of his ShoeZeum, Nike lifted his ban from their outlets. However, Nike has yet to give him give him the “hook up” on new releases, but they have extended job offers to him that he has shut down. “I wouldn’t want to work for Nike. I love their product more than I love the company, “ Geller said. The ShoeZeum is now packed up and closed, with most of the shoes resold on EBay. “I don’t plan on opening up another museum. I think I have taken it as far as I can and its time to move on. I’m going to continue to teach people what I love through my YouTube channel,” Said Geller. Geller continues to live surrounded by shoe boxes and an original dug-up prototype shoe from Nike’s creator’s backyard, sitting on his mantle in his Los Angeles apartment where he lives with his supportive fiancé Natalie. “I admire his passion and commitment tremendously. His wealth of knowledge for shoes is absolutely insane. He doesn't have to look up anything. I've never met anyone like him. The way he talks about shoes and how happy he becomes is contagious.” Natalie said. 10 Books to Read: "Insomnia"